The Fly Filmmaking Challenge will return to the 2018 Seattle International Film Festival (SIFF) after a three year absence. The challenge is for six filmmakers, all from Washington State, to plan, film and edit a short film, which is only 5-7 minutes long. This year, the style is documentary. The selection committee consults with the filmmakers about theme ideas that they might like to pursue. Then, the committee comes up with a theme and assigns one of their brainstormed ideas to each filmmaker. Olympia filmmaker, Jeff Barehand, has lived in Olympia for eight years. Originally from Arizona, he is a member of the Gila River Community and Navajo Nation. He was nominated for the challenge by others in his trade. He says it is nice to be recognized by his peers. He wasn’t sure what topic would be chosen for him, but he was pleased when he found out it would be wood carving. Barehand tells me he didn’t know what the topic would be when he picked the wood carving theme. 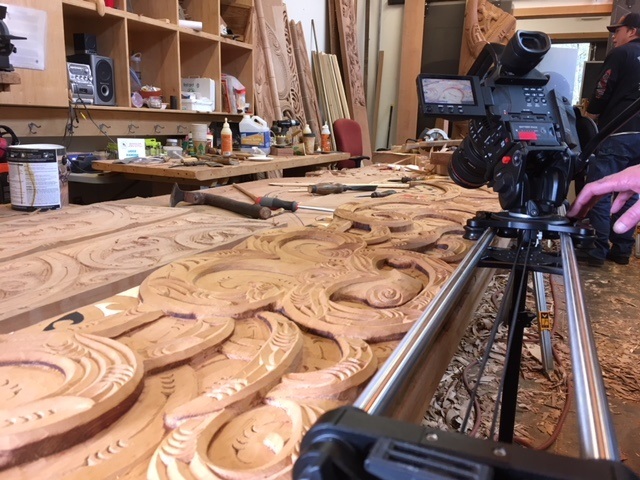 He wanted to pick something that he thought would make an interesting story, and something visual like wood carving might work well for a documentary. 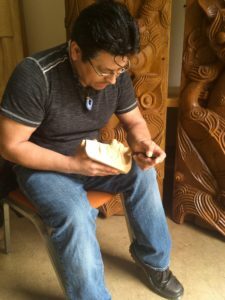 When SIFF got back to him and told him that his topic would indeed be wood carving, he contacted Alex McCarty at The Evergreen State College. Alex is an alum as well as a faculty member. Barehand was aware of the art produced by Alex and his brother Micah, but he had never met him before. The film’s focus is the creative and collaborative effort between Alex and renowned Maori artist Lyonel Grant. 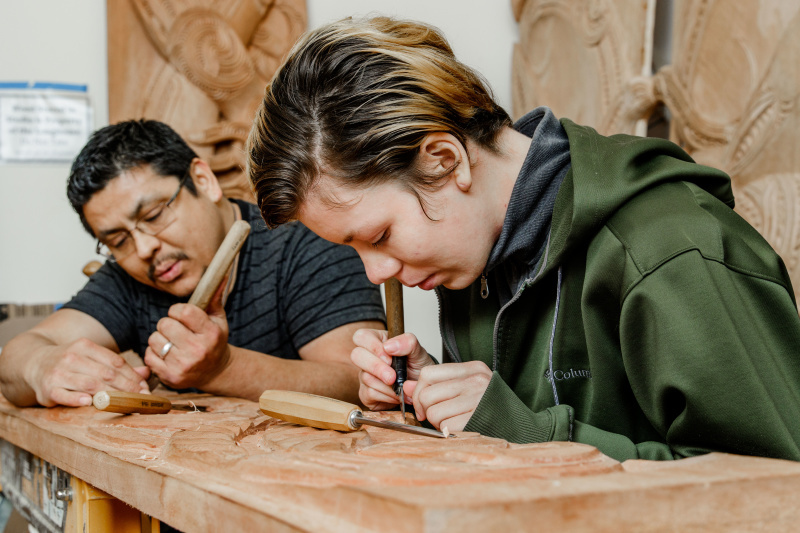 Alex and Grant worked together creating carvings for the new fiber arts building, which is scheduled to open in October 2018. Alex was born and raised in Neah Bay. He is a member of the Makah tribe, an indigenous people for whom carving is a large part of their culture. He left Neah Bay to attend Evergreen. Now he teaches a number of courses there, mostly focusing on visual arts. Alex began work creating carvings for the new Fiber Arts Studio about a year and a half ago. The western elevation of the building is done in the Puget Sound Indigenous style, while the eastern elevation is in the Māori style. The Māori are the indigenous Polynesian people of New Zealand. “It’s a huge responsibility on their part to come together and combine the two designs, the traditional indigenous and contemporary designs,” Barehand explains. McCarty tells me that the significance of this project cannot be understated. 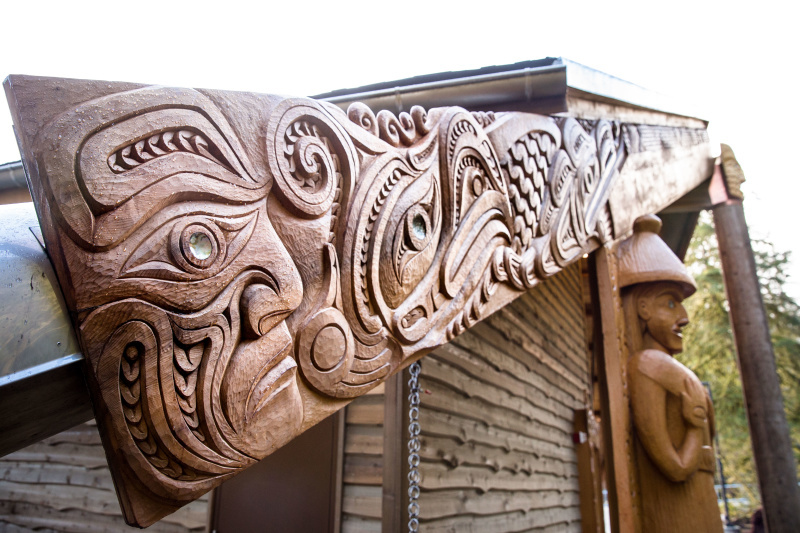 “No one has done this sort of cross cultural [Makah-Māori] work of this scale before,” he says. They are creating something new that draws from tradition. He hopes that this project, which draws from history, will inspire future generations to practice traditional art forms, to try something new and to collaborate with others from many different places and backgrounds. The work is not only international, but mutigenerational. Alex’s daughter, Tierra, is one of the carvers working on the project. This spirit of collaboration extends beyond McCarty’s carving work to Barehand’s film. Barehand worked on other Fly Challenges in the past as support crew. This is his first time working lead on the challenge. However, he stresses that a project like this is not done alone. It is a collaborative piece which relies on the effort of others to be successful. Barehand is a founding member of the Olympia Film Collective. When he was selected for this challenge, he was able to receive support from other members in the collective, like his production assistant Jason Murley. Murley helped with all aspects of the project, including setting up lights and equipment. Also from the Olympia Film Collective, came Barehand’s second unit director of photography, Jason Roberts who did much of the filming at Neah Bay. Barehand says a big part of the challenge is completing it within 10 weeks while balancing work and his role as a father to five kids. The film looks at where creativity comes from and how the artist uses creativity to better their community. One could say that the Fiber Arts Studio is how Alex does that, but maybe it’s more. Maybe the collaboration is what is truly benefiting the community. And Barehand, as the documentary storyteller, is using his creativity to benefit his community too. The Fly Filmmaking Challenge will premiere on Monday, May 28 and will screen again on Wednesday, June 6 as part of the Seattle International Film Festival which runs May 17 – June 10.